So far in this short series on why the Bible is unique among the spiritual writings of the world religions, we have seen that the Scriptures reveal human mimetic rivalry and the scapegoat mechanism, and that Jesus fulfills the Hebrew Scriptures (just as He fulfills other religious writings as well). The question we concluded the previous post with, however, was that if Jesus fulfills the hopes and dreams and ideals of other religious writings as well, why did Jesus come specifically in fulfillment of the Hebrew Scriptures. This post seeks to answer that question. 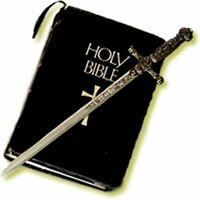 The third reason the Hebrew Scriptures are unique among all religious writings in the world is that they are the most violent religious writings in history. While I do not consider myself an expert on all the religious writings of all of the main religions in the world, I have read most of the main religious texts for most of the main world religions, and while it is not uncommon to find violent events being described in these other religious books, no other set of religious writings comes even close to describing the violence and bloodshed that one finds within the pages of the Hebrew Scriptures. And I am not referring to simple descriptions of human violence, though there is a lot of that within the Bible. I am talking about direct commands from God for His people to go and commit violence. I am talking about commands from God for His people to engage in genocide. 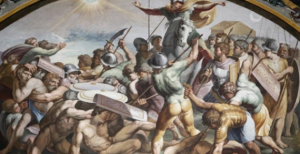 I am talking about descriptions of God intentionally setting plans in motion to wipe out entire groups of people (such as the Amalekites), and to kill through natural disasters millions (or maybe even billions) of people (as in the flood). 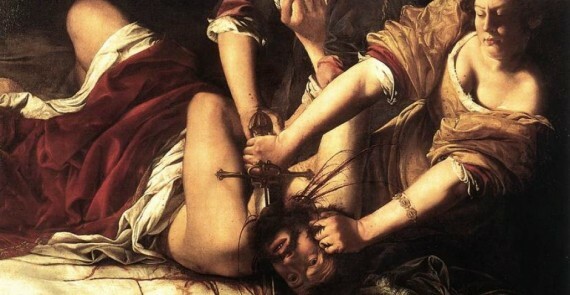 When taken as a whole, the Bible is the most violent religious text in all of history. Not even the violence of the Muslim Qu’ran comes close to describing and divinely sanctioning the violence that is found within the pages of the Hebrew Scriptures (see Jenkin’s book, Laying Down the Sword). This certainly makes the Bible unique! Though it is not in a way most Christians are comfortable admitting. And yet, there is a deep truth here we must not miss. I ended the previous post by asking why God would have Jesus come to fulfill the Hebrew Scriptures if Jesus can conceivably be the fulfillment of other religious Scriptures as well. I believe that one of the reasons God chose to have Jesus fulfill the Hebrew Scriptures is because they are the most violent Scriptures. Did God choose to do this because He Himself is utterly violent? No! Quite to the contrary, the God which Jesus reveals to us is completely non-violent. The God revealed in Jesus Christ would rather die for the worst of His enemies than seek the death of any one of them. Why then did God choose to send Jesus to specifically fulfill the most violent religious writings of all time? So that He could do what only God can do: So that He could redeem it. God wants humanity to understand that nothing and nobody is beyond the scope of His redemptive purposes, and so by sending Jesus as the fulfillment of the most violent of religious texts, God not only revealed Himself by way of a stark contrast to that violence, but also showed how to reinterpret and understand those violent events in light of the self-sacrificial God dying on the cross for the sins of the whole world. People rightly question how a good and loving God can allow violence in the world. God answered this vital question by sending His Son, Jesus, as the fulfillment of the most violent religious writings, to show us that He had nothing to do with the violence, but was instead dying along with us in the midst of the violence, taking our sin and suffering upon Himself, bearing our guilt and shame in His own being, all for the sake of those He loved. Jesus fulfills the hopes and expectations of the violent Hebrew Scriptures by suffering instead of conquering, by serving instead of killing, and by dying so that others might live. Though we may not always understand why and how sin and suffering enters into God’s world, one thing we can know through the crucifixion of Jesus is that God does not send sin and suffering, but rather, is a victim of it along with us. With every shed tear and every cry of pain, God suffers. This is why God chose to have Jesus come in fulfillment of the most violent texts. He wanted to show us that God’s role in those violent religious texts is not in the inflicting of pain and suffering of others, but in receiving and suffering that pain along with us. In Jesus, we see that God is not against us; God is with us. This makes sense. Especially in light of some information I received when Wm. Paul Young, author of “The Shack” gave a talk at a local college a few years ago. Those who’ve read the book know about the tragedy that happens at the beginning, and how difficult it is to read that part of the book. The author explained that he wanted to pick the most horrific thing he could think of, the killing of an innocent, so that we would understand what a huge thing God forgave and what God was enabling Mack to deal with and forgive. Interesting. I guess I assumed that is why he picked that tragic event, but did not know if my assumption was correct. Thanks! The bible is more violent than the Quran in its retelling of events; however, the Quran is more violent in its directives to its adherents to perform violent acts. Big difference and absolutely necessary in understanding the world view behind each of the two texts. Jihad: The Sixth Pillar of Islam. But that isn’t even remotely as violent as _Liber Al vel Legis_ permits one to be — if one is not a slave. This is probably true, especially for a Christian reading the Bible … but there are many direct commands to the Jewish people to engage in violence, and if history is any guide, Christians have often used these commands to justify our own violent behavior toward others. Maybe I’m missing something here and I want to understand. I know that Jesus died so that we might live and in the midst of the violence that God suffers but I still can’t grasp why God told his people to kill thousands of people and yet He is such a loving God. I wasn’t trying to put you on the spot like that. I know that God cared very much for His people in the Old Testament and protected them, even when they sinned against Him. Plus He was paving the way for the Messiah to come as He spoke through His prophets. This may be an area we won’t know in full until we meet Him face to face. Happy Father’s Day to you and all your readers, and of course our Heavenly Father!